"Pflueger's to-do list is quoted in ‘Art Deco San Francisco: The Architecture of Timothy Pflueger,’ a thoroughly enjoyable monograph being published next month by Princeton Architectural Press ($55). The unusually accessible text is by Therese Poletti, while images from the first half of the 20th century are augmented with vivid new photographs by Tom Paiva." 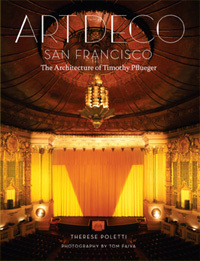 "One book that just came off the press that I’m ecstatic about is Therese Poletti’s weighty work, ‘Art Deco San Francisco: The Architecture of Timothy Pflueger’ (Princeton Architectural Press, $55)." "This generously illustrated, 256-page tome is the story of an immigrant’s son who over a career that spanned 40 years would change the appearance of the beloved ‘City by the Bay.’…Poletti’s tribute to Pflueger’s remarkable achievements is a landmark unto itself. Indeed, it’s simply grand." "The book paints a portrait of a young man who came of age in the aftermath of the devastating 1906 earthquake and fire that leveled much of San Francisco, and went on to design some of the most beautiful buildings erected in California during the 1920s and '30s." “Thank you, Therese Poletti, for bringing forth an exquisitely designed, well-researched and well-written book on one of San Francisco’s geniuses of design, Timothy Pflueger….